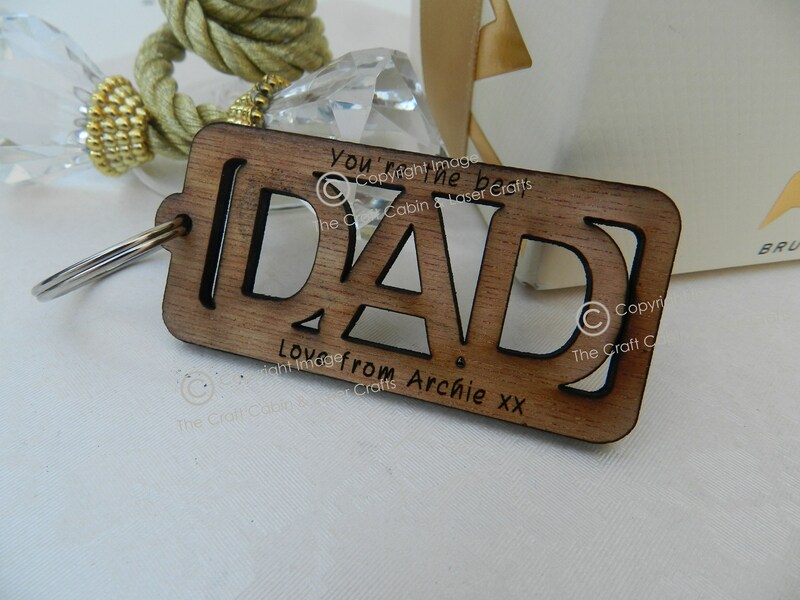 Personalised Dad Wooden Key Ring. Custom Ideal Special Gift Engraved for Father's Day, Birthday or Christmas. 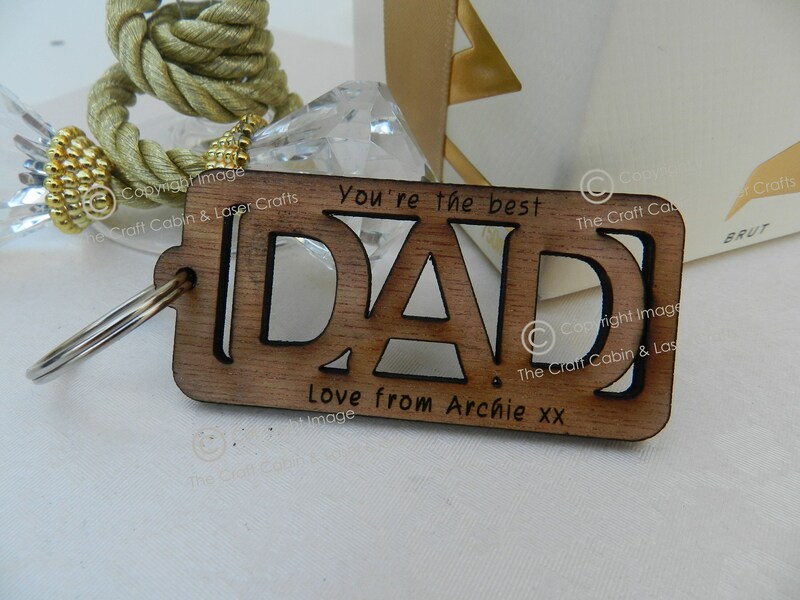 Personalised Dad Wooden Key Ring. 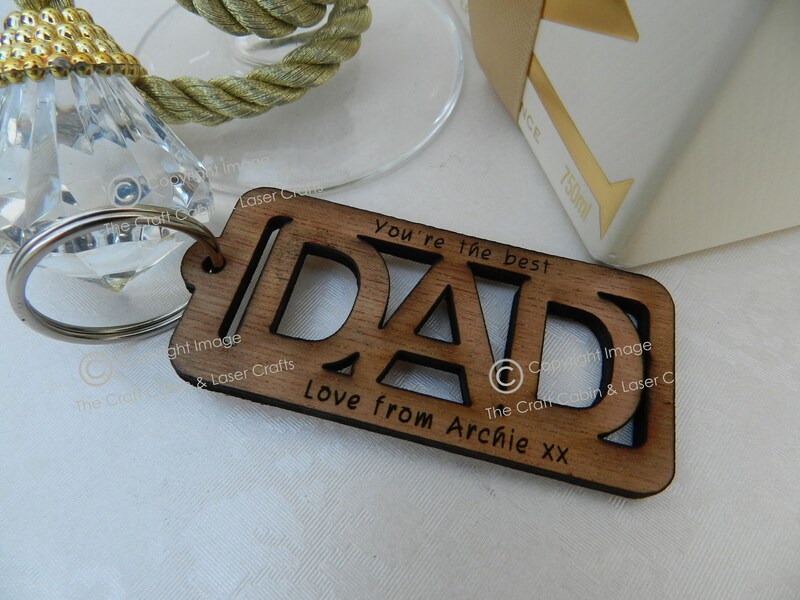 Ideal Special Gift Engraved for Father's Day, Birthday or Christmas. Beautiful, laser cut & engraved from 6mm high quality Oak. Personalised Key Rings. · Personalised With Your Own Text - above and below the text cut out. Please note* to help speed up the process, we do not send proof's. your cake topper with 5-7 business days. To fulfil your order, you must provide us with certain information (which you authorised Etsy to provide to us), such as your name, email address, postal address, payment information, and the details of the product that you’re ordering. You may also choose to provide us with additional personal information (for a custom order of products, for example), if you contact us directly. - Service providers. We engage certain trusted third parties to perform functions and provide services to my shop, such as delivery companies. We will share your personal information with these third parties, but only to the extent necessary to perform these services. - Business transfers. If we sell or merge the business, we may disclose your information as part of that transaction, only to the extent permitted by law. - Compliance with laws. We may collect, use, retain, and share your information if we have a good faith belief that it is reasonably necessary to: (a) respond to legal process or to government requests; (b) enforce my agreements, terms and policies; (c) prevent, investigate, and address fraud and other illegal activity, security, or technical issues; or (d) protect the rights, property, and safety of my customers, or others. - Change, restrict, delete. You may also have rights to change, restrict our use of, or delete your personal information. Absent exceptional circumstances (like where we are required to store data for legal reasons). We will generally delete your personal information upon request. - Object. You can object to (i) processing of some of your information based on our legitimate interests. In such cases, we will delete your personal information unless we have compelling and legitimate grounds to continue using that information or if it is needed for legal reasons. - Complain. If you reside in the EU and wish to raise a concern about the use of your information (and without prejudice to any other rights you may have), you have the right to do so with your local data protection authority. Please add your personalisation details in the message to seller box at checkout. Due to the manufacture process of our wooden products. All products will have burnt, rustic edges. This is normal. However, if you feel you may need them to have a cleaner look, you can gently give them a wash with a little wash-up liquid, pat with a dry cloth and lay out to dry. Do not soak or immerse in water for any long periods. Many of our acrylic products, will arrive with a protective film on the front. This may have a residue on the edges, due to the laser cutting production process. You will need to remove this protective film before use.